PARIS — Cam Slicer heard a pop from his right leg. A few seconds later, Shane Slicer heard a fellow football coach call his name. Slicer quickly realized that the player lying on the ground on Oxford Hills’ practice field was his son, whose right ankle had given way while he was trying to make a cut on a route. X-rays showed an oblique fracture to his fibula, requiring a plate and nine screws, plus a high-ankle sprain. Once it settled in that the Week 4 injury would prevent Slicer, then Class A North’s leading receiver, from returning for football season, the focus for Cam and Shane Slicer was on a full recovery for baseball season. “Once I knew football was out of the picture, it was just kind of take it easy and do what (Oxford Hills athletic trainer) Jillian (Burrill) says,” Cam Slicer said. A little more than six months later, Shane Slicer, Oxford Hills’ baseball coach, will write Cam Slicer’s name at the top of his lineup card, with an 8 next to his center fielder’s name when the Vikings open their season next week. Cam Slicer followed his doctors’ and trainers’ instructions carefully during what turned out to be a relatively quick and easy rehabilitation. He spent two weeks after his surgery in a splint and six weeks in a boot. He attended every football practice and game but stayed away from serious physical activity until December. By then, he was taking swings in a cage and throwing, and was ready to try running at full speed a short time later. 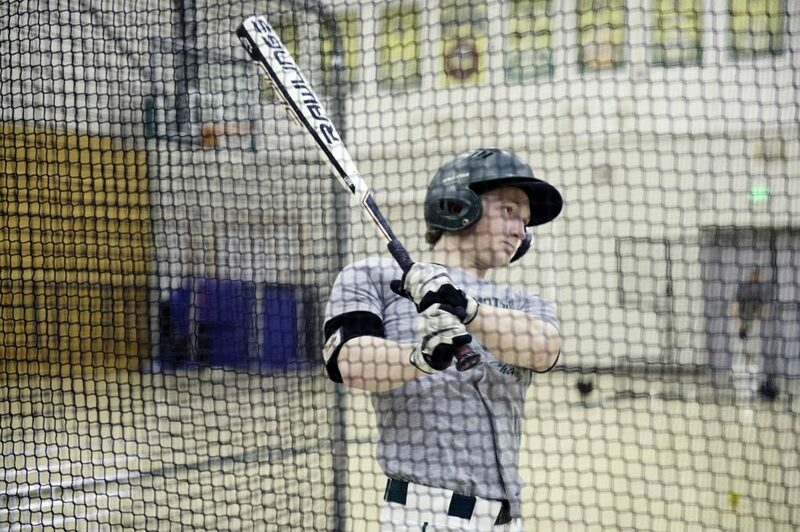 With the arrival of baseball season, Cam Slicer, who will enroll at University of Southern Maine next fall with plans to play baseball there, doesn’t think his ankle has slowed him down at all. The pain, which doctors have told him is normal, is about the only thing that reminds Cam Slicer of the injury and shows his coach that he’s still not quite all the way back. With the Vikings scheduled to open their season against Messalonskee next Tuesday at Lewiston High School (12:30 p.m.), his father knows there is no holding him back after watching Cam play in a couple of scrimmages with no problems. 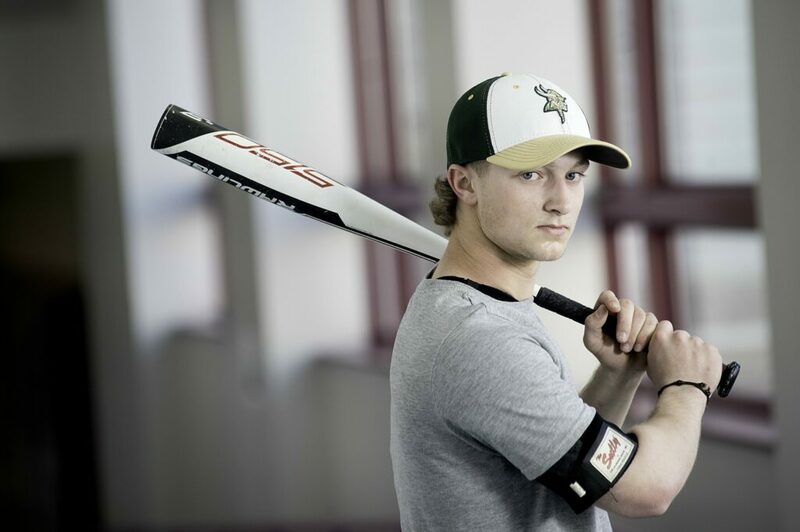 The Vikings would have missed Cam Slicer as a spark plug for their offense and patrolling the vast center field at Gouin Sports Complex, but they would miss the intensity he brings more. With a strong senior class led by Slicer, UMaine-bound ace Colton Carson and shortstop Janek Luksza, the Vikings are eager for one more shot at the school’s first state title since 2010. After being denied a regional title in high school and a state title in American Legion last year, they have a chip on their collective shoulder providing extra motivation. Given how Cam’s football season ended, both Slicers knows not to take one last championship run for granted. “We’re close, very close, so this is kind of a special year,” Shane Slicer said. “It is for all of them, all of his classmates. The team is close. There are six or seven guys we go on fishing trips with. Him being part of that and being the leader of the group, it’s awful nice to see that he’s back.